If you’ve followed my work for a while, you might already know that writing does not come easily to me. I’ve gotten a lot better, but I find the sight of a blank page so daunting, and the “get-it-perfect” part of my brain goes into overdrive. I learned a long time ago that I do a lot better when I can go for a walk and speak my writing aloud. I used this technique to trick myself into writing my first two books, and now I use it for basically any piece of writing I want to do. I’m sure I’m not alone in this aversion to writing and preference for speaking! So in this episode, I’m sharing my tools with you, in case you’re like me and feel more comfortable speaking your ideas than writing them all down right off the bat. I’ll walk you through the three-step process I use when I want to use my speaking to write a blog post, freebie, and even my books. I also talk about the benefits of talking to yourself, why I walk in the woods when I want to do some writing, and how the many different types of public speaking can contribute to making your book a reality. If what you heard here today was useful, you’ll love the free guide I’ve created for you at speaksoitmatters.com/yes. 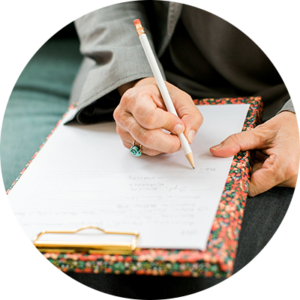 Sign up now and get immediate access to our Power & Grace Speaker’s Toolkit (including The Only Presentation Outline You’ll Ever Need). How I learned to speak my way into basically everything I create. 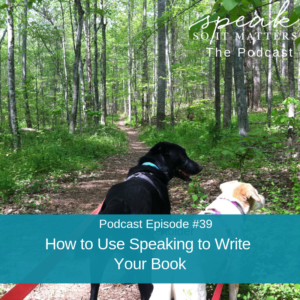 The three ways that speaking can help you write your book. How talking to ourselves can help us create psychological distance from our thoughts and ideas. Why sharing my ideas with an audience is such a crucial stage of my writing process. Why I encourage people to create a super-detailed outline before they begin speaking their book. How I’ve written my books with the help of a team that includes transcriptionists and a fantastic editor. Ep #37: What’s Blocking You from Being Visible as a Speaker? You are listening to the Speak So It Matters podcast, episode number 39. Welcome to Speak So It Matters where we share a mix of stories of inspiration, and super practical public speaking and communication guidance to help you release all the barriers to becoming the speaker you know you’re meant to be. Some of us are called to use our voice to serve others, and our world, as well as to become the most fully expressed version of ourselves. If that’s you, you’ve landed in the right place. Let’s do this my friends. Hello, my speaker friends. I just love it that we’re here together again. I just hopped off of a podcast interview straight into this conversation with you, and it just struck me and knew there are just so many ways to use speaking to serve by sharing your message far and wide in our world. I know I’ve been talking a lot about podcasts lately. It’s just very much in my mind, and in my world right now, but look at this. 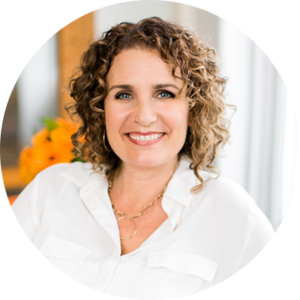 I just got to share my mission with another brilliant thought leader through her podcast. I’ll let you know who the mystery woman is when the podcast episode is in action. Our brain does love a puzzle, you know? And, now I’m public speaking in my own podcast, so it really helps to just expand our ideas of how we can use speaking to make a difference in the world. Can you see how you can public speak in all kinds of ways? So, just let this be your little PSA, your public service announcement. Speaking isn’t just for stages anymore. Actually, it really never was just for stages, but now with the inter web’s fanciness, you have even more options, podcasts, webinars, Facebook lives. There are so many ways to serve with your message, and, of course, the stage is an awesome place. The front of the room, the board room, wherever it is that you’re sharing your message. I just love the idea of you expanding ideas, your own conceptions of where you can share your message. In fact, I wrote my latest book Beyond Applause with a whole lot of help from speaking, and that’s what I’m gonna talk about today, how I used speaking to write that book, and actually how I used it to write the two books prior as well. The truth is, I speak my way into everything I create pretty much, but I’ll tell you more about that in a bit. Here’s the truth, I don’t love to write. You may have heard me say this before, maybe a lot of times, maybe ad nauseam, and it’s actually getting better. The more I see that that sort of resistance to writing is just a bunch of thinking that’s been in my head for many, many years, that makes writing so painful for me, the more I see that … It doesn’t actually inherently have to be painful to write, and, interestingly, because whenever we see that a bunch of thinking is causing us so much resistance and struggle, there’s often a room in there for it to not be such a struggle. But, anyway, I know that this is actually what it’s like for speaking for some people. I feel that way about writing, and you probably know people, or maybe you have this a little bit that feel like speaking causes a whole lot of thinking in their head, and they feel a lot of resistance, but either way, this is the struggle for me, and I wanna offer it to you how I use speaking to write my books. Just in case you know you have a book living inside of you, and you’ve been feeling this stuckness around getting it out, so there’s this impatience that I feel when I’m supposed to when I’ve decided I’m going to sit down to write. I mean, maybe it’s just the way my brain is wired or has become wired over time however that works. I was diagnosed with ADHD about six years ago, and maybe there’s something in that, that my brain just kind of is like, “Whoa, sit down, and, you know, do that focused work.” It just feels overwhelming at first, but whatever it is, every time I think about a big writing project, okay, actually, this even happens when I think about writing a blog post, but I get all agitated feeling, and my brain gets a little foggy, like all of a sudden I don’t know what I would wanna say which is weird, right? Especially since I’m often going in knowing what I wanna say, and maybe you’ll relate to this because I don’t think I’m alone in this. Again, maybe it’s not about writing for you, but it’s about crafting that next talk, which of course, is writing, but it’s thinking through writing up a talk, or mapping out a talk, and a lot of times that foggy brain can just come in, and make us feel mixed up, cause us to feel mixed up, and unable to create, so given that anytime I get this sort of idea that I need to sit down and write, I get overwhelmed and stuck. Imagine what my brain did when I decided to write a book, but here’s what I’ve learned, it’s that doesn’t happen to me when I walk and talk. I can actually, my ideas tend to, now this isn’t every time, and I’m not saying that the walking and talking necessarily causes it, but for me, it’s pretty reliable that when I get up, and move my body, and talk out loud, my ideas flow more naturally. It’s something I’ve learned over the years really out of necessity. It’s how I made it through undergrad, and grad school, how I’ve written the books I’ve written, and all of that, so if I get up out of my chair, and head outside, especially, though I’ve actually done this circling in my living room too plenty of times, the words flow like magic, and I can even say some of the coolest things that are totally unexpected. You may remember that that’s actually how the whole model for the five C’s, which you may have heard me talk about. We’ll link to that podcast in here, but the five C’s that makeup, The Five C’s of Thought Leadership Speaking came all in one walk and talk in the woods with my dogs. When I began writing my first book which is no longer available, because it just needs, too big of an overhaul. It was a long time ago, but it was gonna be a 10-page maximum PDF. It was gonna be one of those free gift, like I offer on my website now, but it turned into this 200 page, 200 plus page book that I ended up binding, and selling, and all of that, but the relevant point is that I actually wrote the outline, and a lot of the content while I was walking, and that’s actually how it ended up becoming this 200 plus page book. In fact, after that, I also, “Wrote an article.” Which I spoke out loud during a walk around how I tricked myself into writing my first two books basically by saying, “Oh, I’m just gonna create this small, you know, PDF, and I’ll just talk it through, and then, I’ll transcribe it or whatever.” Which I’m gonna talk to you more about in a minute. And then, it just ended up blossoming, because the ideas are in there. I know the ideas are in there for you too. We just need a way to get them out of there, and into this format that other people can consume. When it came time to write my next book, after that first book many years ago, my next book was called Soul Power To Your Message. It actually still is called that, and I mapped it out on a walk in the woods near my house in Virginia, that same woods, very creative woods. Now, I’m not saying that I loved the writing process after I mapped it out. I went for a walk, and I said, “Okay, I have this book idea. What does it look like?” And I turn on my voice memo app, and I just talked it through like, well, here’s what I wanna say. In fact, I didn’t know it was gonna be called Soul Power To Your Message at the time. What I knew is that I wanted to share my process that I take clients through for crafting a talk in a format that was easily consumable that would reach a broader audience. That’s really what Soul Power To Your Message is. It’s how do you craft a talk based on your own core message at the center of your work, so it’s not like I did that, and then, the book was written. I still, I mapped it out on that walk in the woods, I still had to sit my [inaudible 00:08:42] down and get words on the page, and I did do that with that book, but saying it all out loud was so clear and focusing for me as I did the outline. I created a really well-blossomed outline so that when I came back to my office I really was able to just kind of layout the outline really quick. I’m a fast typer. And then, I could just kind of fill it in over time, but I was no longer staring at the blank page, which is really important for me since writing causes all that thinking that makes me feel stuck, so then when it came time to write Beyond Applause, which was a number of years later, I knew I’d be speaking a lot of the content just from those previous experiences, but this time the speaking element was even more integrated, because I refined the content through speaking with audiences, so that’s what I wanna offer you today, Three Ways That Speaking Can Help You Write Your Book, and those three ways are, and I’m gonna cover each of these in more detail. But, first of all, it’s saying your thoughts out loud, because it helps you organize them in a new way, and then, I’m gonna talk about how sharing your message with audiences can help you refine the content so that it’s as awesome as possible so that you love what you’re writing, which has made it feel more flowy for me, and my experience, and then, lastly, I’m gonna talk about how from a clear outline you can actually kinda speak your whole book, or almost your whole book, and I’m gonna talk about how I did that with Beyond Applause. Let’s talk about saying your thoughts out loud, and how it helps you organize them in a new way, and I alluded to this in the beginning, but, again, everything of substance I’ve ever created started on a walk and talk, at least in the last I would say 10 years. That’s not true. I didn’t know about this when I was in college. Boy do I wish I had known about it then, but I didn’t. I hadn’t tried it at that point. But, my books were all mapped out by walking and talking into my voice memo app. Every talk I create for myself is crafted this way, so it’s not just books, every talk. If I know I have a talk, I grab my phone, my headphones, I talk to myself out loud into the voice memo app and record it, and I do this usually both before just to kind of map out my ideas, and then, I do it again after I’ve done a brainstorming session, like with sticky notes. I usually come back to my office, and then, expand upon the outline that I have fleshed out on that walk, and then, I’ll do like a sticky note exercise with all kinds of expansion of the content, and then, I’ll go for another walk and talk, and just kind of see how it’s sounding, and flowing. Now, I’m not saying you have to walk and do this, like maybe walking isn’t important to you, or being outside isn’t important to you. None of those things cause the flow, but for me, that talking out loud, it’s such a fascinating thing, and I actually started to do some research on this, because I was … I started wondering why talking out loud helps me so much? Then I found this article in the New York Times where they cited research that talking to ourselves creates this kind of psychological distance, and with that psychological distance we have a more objective view or a clearer view of what we’re trying to say. It makes me realize why I talk through so many things out loud like if I know I have a difficult conversation. I swear the whole world now knows that I talk to myself all the time. We’ll put a link to that New York Times article. I think it’s called like, Benefits Of Talking To Yourself, or The Benefits Of Self-Talk, something like that. We’ll put a link to it. But, when I was first writing my book I thought I had a pretty clear idea of the core message of the book, and I remember saying it out loud while I was on a working retreat, which is my favorite way to talk to myself, because then, I have all day in this like private space. Someday I’ll do a podcast all about how to set up and make the most of a working retreat, because that is how I have gotten so many of my creative projects done, but I remember saying, I had this idea for writing my book, and I remember saying it out loud, and realizing that this initial way that I was thinking about creating this book, and mapping it out just didn’t make sense the way I imagined. While I thought about it in my head for a long time, weeks and weeks, maybe even a few months, just saying it out loud, is really what showed me the gaping holes in the focus of the book. Again, just in a very broad sense, this is one of the ways I use speaking and used speaking to write all three of my books. The book took all kinds of turns from there, but that first talk through was really a big revelation. If you have a book in mind talk it out, like say it out loud, create that psychological distance for yourself, and see if you can hear it and see it. Even as I’m doing this podcast right now, I keep putting my hand out in front of my face, because that’s where speaking out loud puts your content. Just kind of out in front of you, and in a way I can almost see it more clearly, even visually almost that way. And, again, you might decide to create a visual representation of it. Say it out loud, put it on a whiteboard. Sometimes I do that too, but it is the saying it out loud that helps me get it onto that whiteboard in an organized way. Every story in my book was first a story that I shared out loud often to myself, so oftentimes I just test it out. I talk the story through, see if it flows right, see if the connection that I think it makes to the concept I’m sharing actually plays out when I talk it through, but I also … It’s saying it out loud with clients, it’s speaking those stories with clients, with my husband Jim who is the most patient, amazing listener on the planet for sure. He hears me speak through things so often. It’s just incredible. And, with my business friends. If you’re not comfortable, or it doesn’t feel sort of the … It doesn’t have the same impact for you to just say it with yourself, saying it with business friends, people in the mastermind that you’re in, or any way that you gather with colleagues, just say, “Hey, do you think I can … We can go have coffee, and I can talk through my book?” And, you can offer the same kind of thing for them on some kind of creative project they’re working on. With stories, in particular, it’s hard for me to really feel the landing of the story, like the real power of the point of the story if I haven’t heard it out loud myself, which is where the power in saying it out loud comes from. Again, I realize this isn’t true for everyone. There’re all kinds of learning and experience style preferences, so you just might not realize how much this particular approach could help you, so give it a try. See if it helps to do this with stories, and some of those details, so that’s the first one, is I use speaking out loud to organize the concepts in the book, and then, and this was really powerful. I shared the whole message of the book, those concepts that I mapped out with audiences, and they helped me refine the content so you can do that too. Share your message, craft that overall outline of this book that you have in mind. Turn it into a talk, and then, go share it in front of audiences. Notice what questions they ask, notice where they look confused, and where you need to refine the content. When I first started to conceptualize the content for Beyond Applause, the ideas felt true, but they felt kind of speculative. It was like, okay, in all my years of experience, and in what I see in speakers and thought leaders out in the world, what seems to be the path to getting on these great stages? I knew the question I was, that I wanted to answer through the book, I knew what felt true, but I really felt like I needed to test it, see how it landed for other people, because I had never put it together that way before, so I had this awesome opportunity to speak at the Hivery’s Entrepreneurial Lab, so I put on a workshop style talk there, and I got all kinds of amazing feedback. I got the exciting feedback that they were really amazed to just sort of see that very clear and simple path, but they also asked me all kinds of questions. They pushed back on a few things that I thought made sense initially, and I got to clarify those, and refine them, and go back to my client stories, and see what felt really true, and shift accordingly. I did that for a speaking event, and then, I did a webinar, and I got to test it more, and people ask different kinds of questions on a webinar so that was really interesting to learn, and it draws a different type of audience, and then, I spoke at another event, and then, I spoke at a small WPO Women Presidents Organization meeting, and learned all kinds of things. It was a really small group that night. They actually had a really small local meeting, and it was amazing the engagement and feedback I got, and every time I got to refine the content, make it even better, gather stories and examples from these conversations I had in my speaking. So, that’s what I did each time I integrated what I learned at these events, the stories, the questions they asked, the new ways of explaining things. By the time I wrote the book, I knew the concept was awesome, because so many people had given me that feedback, and really had helped me make it that way, and I could see that … I could see what it took in person in these, well, not just in person, also in online events like the webinars. I could see what it took to not only share the concepts with them, but share them in a way that they could take them, and use them in their lives. It took some time so that I could get that kind of feedback, but it was, and still is invaluable to me, so this is the next level of way that you can use speaking to write your awesome book. And then, finally you can speak to write your book literally, so from a clear outline, a really well blossomed outline with the story references, and all of your research, and all that stuff in there, you can actually speak, record your speaking, and have your book transcribed, and this might be the most fun use of speaking to write your book of all. Although, I don’t know that whole speaking to audiences is so cool, but it’s really fun if you’re like me, and writing makes you feel super antsy just to think about it, because I remember I went on a number of writing retreats to write Beyond Applause, but I remember the first writing retreat where I was doing this pretty much the whole time, so I had a broad outline of the book, and then, I would concentrate on one section, blossom out that outline kind of painfully, because all my thinking about writing issues. Again, here’s how I did that. I wrote a high-level outline of the book, and then, I would take a section of it, and I would blossom that outline in even more detail. I would do some brainstorming with sticky notes. I did do … There was writing, but it still felt kind of broad enough, and I guess I didn’t have a lot of that, like I have to make it perfect thinking, which I think might be what gets in the way for me in the initial writing process, so then I would write up sort of the next level of that outline with my brainstorm integrated, so I basically knew the map of what I wanted to talk about, and then, I would speak into the recorder, and have it transcribed. I did get better at this as I went. At first, it was really messy, there were big pauses in the transcription. I would say things, it was funny I would say things to the … into the recording, and say, “Okay, don’t transcribe that. If you can just delete that last section.” And, instead of actually doing what I asked they would just transcribe that, they would transcribe the words, “Okay, don’t transcribe that.” So, I just got better at learning how to create a transcription that was more useful to me in the editing process, because this isn’t perfect of course. There’s more rewriting, and there’s the editing to do, and writing is not the same as speaking even when you have a very conversational writing and speaking style, which I do. I like my speaking to feel very conversational, and my writing to feel very conversational. I wouldn’t know how to do it any other way, but it still is not a direct translation. Speaking style does not sound right in writing, so I did bring on an excellent editor who I found on Reedsy by the way, R-E-E-D-S-Y. We’ll put a link in there. Such a great resource for you in writing your book, and I did. I went through a pretty interesting process. Another thing I could do a whole podcast about is finding the whole team who helped me publish my book, but I did find a good editor after doing some good interviews and that kind of thing, and she got my voice right away, but she also just made sure good grammar was in play and all of that. I just want you to know that if writing a book is on your list, but you’re struggling to do it, and it’s easier for you to just speak things to say things, which may be the case, because you are here at the Speak So It Matters Podcast. You can totally do this. Believe me, I’m the most reluctant, “Writer.” ever, and I did it, and it just … It was like not dealing with that blank page that helped so much, and by the way, I almost can’t believe I’m gonna say this, but I’m even planning to do it again. There’s another book that’s coming probably toward the end of 2019, maybe 2020, but if I do this again, well, when I do it again, here’s what I will do, and won’t do next time. I will outline, and I will outline as clearly as I can, that is so helpful. I will absolutely do as many talks on the topic of this book as I can, and use that process to refine the content through speaking. This is at the top of my list. So many amazing stories come from speaking and learning from your audiences as you go, so many stories … I mean, the opening story of my book in Beyond Applause is a great example that came from speaking. I might speak to transcribe, but I’ll keep that for just creating flow because I have to say that the editing was pretty painful for me as well, but that may or may not be the case for you. That’s why I still wanna keep this in here, or the other thing is because I do love that beauty of having that transcription come back with all those words already, “Written.” Actually, they are written, right? Because they’ve typed them up for you. Or, I’ll bring in an editor way earlier, and I’ll make it much more collaborative so instead I’ll say, “Okay, we’ve got this really messy, but well organized, because I do have that outline already mapped out manuscript, first draft manuscript, and I would love to have you step in now, and help me make sense of it.” I think if you come out this early with an editor who’s game to really collaborate, that part of the process could flow really, really nicely, and I’ll say, I will for sure talk to myself. Honestly, I wouldn’t know how not to, but that whole, when I talk about speaking I’m talking about every way of speaking from self-talk, internal, to speaking out loud, to speaking to audiences, to speaking to write your books, all of it, and you can use all of that to craft, to finally write the book that there’s a good chance you’ve been wanting to write. I speak to so many of my clients, and just so many people who listen to this podcast. Yes, they wanna speak, and usually, they also have a book that they either want to write or want to have written, which is how I often think about it. Speaking is the best way I know to explore a message, test it out, hear it out loud, and turn it into all kinds of useful content including a book. If you’re daunted by writing a book seriously, start with speaking, and you’ll see it come to life, and you do know that you can get my whole book right now for free, right? Do you know that? It’s available at michellebarryfranco.com/freebook, so you can get Beyond Applause. You can read that first story that came from a speaking event. You can actually see the product of having gone through this process. Inside that book you’ll also get access to a resource page, an online resource page with all kinds of additional goodies including the only presentation outline you’ll ever need, which I hear over, and over, and over again that people just, they use it all the time over, and over, and over again for every talk, so you can get all of that for free. Again, michellebarryfranco.com/free book. Alrighty, my friend, you can totally do this. That book that lives in you has a path into our world believe me. Even if you can’t imagine sitting down to write it, let me be your inspiration for that. Meantime, know that I’m over here cheering you on big time. I want to see your message changing lives in the way you know it’s meant to because you know what’s the truest truth? You were made for this. You know how I know? Because you know. Meet you here next week. Thanks for listening to this episode of Speak So It Matters podcast. If what you heard here today was useful you’ll love the free guide I’ve created for you at speaksoitmatters.com/yes. Not only will you get immediate access to our Power & Grace Speaker’s ToolKit, including the only presentation outline you’ll ever need, but you’ll also receive weekly updates with our best resources as they’re created. I can’t wait to see you out there shining your beautiful light, and changing lives with your message.